Suitable for all skin types, the fractional Erbium Laser is an ablative skin resurfacing treatment that significantly improves the appearance of the skin on the face, neck, chest, and hands. With ablative resurfacing, the laser vaporizes the skin cells in a controlled manner to remove the surface layers of tissue. As part of the body’s innate healing response to this controlled injury, collagen is generated in the treated area, promoting younger and healthier-looking skin. The Erbium Laser is an ablative laser than has an affinity for the water content in the skin. 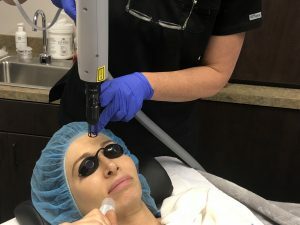 The Erbium Laser light is absorbed by the water in the targeted skin cells causing instantaneous vaporization of the cell in a controlled manner. The surface layers of skin are destroyed, which in turn kicks up collagen production as part of the healing process. You can expect to see an improvement in skin quality within a week of treatment. For optimal results, a series of 3 treatments is recommended, approximately 4 weeks apart. Full results are apparently approximately 3 to 4 months after treatment, as this is the time it can take for the benefits of the increase in collagen to be realized. The pain level is moderate during treatment and immediately after. This quickly dissipates within an hour after treatment. Approximately 1 to 1.5 hours, depending upon the area being treated, including numbing time. recovery time varies depending on the intensity of the laser treatment, as well as an individual’s health and healing rate. In most cases, you can expect 5 to 7 days of social downtime while the skin heals. During this time, your skin will be red, raw, and flaky. The results will last 1 to 2 years depending upon the skin concern being treated and the depth of the laser treatment performed. A maintenance program with selective skin care and complementary treatment is recommended to prolong results. If you are prone to cold sores or fever blisters, laser treatments may induce breakouts. Is is recommended you stop using skincare products that contain Retinol/Retin A two weeks prior to laser treatments to avoid complications with healing. It is also recommended that you refrain from smoking for all at least 2 weeks prior to and after laser treatments to prevent healing complications and ensure optimal results. Please call (541) 312-1145 to book your appointment or complimentary consultation and to discuss any questions you may have regarding your suitability. For Dermaplane treatments in Bend, Oregon, contact the office of Dual Board Certified Facial Plastic Surgeon Dr. Michael E. Villano at Villano | MD.